If you’re planning a diet overhaul to get yourself fighting fit then you might be packing your fridge with nutritious vegetables and leafy salad. As sensible as this is, it doesn’t exactly induce excitement about meal-times. I can’t recall anybody saying, “I can’t wait to rush home and munch my way through my plate of steamed vegetables.” The key to a healthy diet is to make it varied and balanced. Here are just some of the reasons why pork is a worthy addition. Lean meats, when eaten in moderation can be incredibly healthy. They are an excellent source of iron and protein and the lean cuts benefit from reduced grisly fat content. Turkey and chicken breasts are famed healthy meat picks. But, did you know that on average, the fat content of a lean piece of pork is as little as 4%? Maybe it’s time to throw some pork loins into your shopping basket. Protein is essential for healthy cell growth. Lean cuts of pork have on average 21g of protein per 100g. Protein, along with carbohydrates, provides us with the energy we need through the day and keeps our immune system in peak condition. 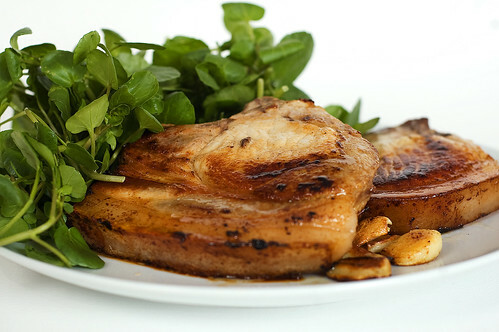 Why not cook up some pork chops in a slow cooker for a healthy, high-protein meal? Making sure you eat foods rich in iron is a simple way to keep your energy levels up and your brain functioning efficiently. Iron is a mineral which helps transport oxygen through the body. A deficiency in this mineral can lead to extreme tiredness and anaemia. Teaming pork with foods rich in vitamin C will help your body absorb the iron, so stir frying some pork with green veggies will provide an extra boost. Pork is also rich in vitamins B1 and B12, so including it in your diet is sure to give you that get-up-and-go. The variety of pork products available is one of the reasons that if I had to choose one meat to eat for the rest of my life then I would choose pork. From a tasty piece of gammon to a succulent sausage stew the possibilities are endless. Not only that, it can form part of your breakfast (bacon sandwich), lunch and dinner. The flavours of pork work well when sweetened (as in sweet and sour or honey) or marinated with a rich barbeque sauce. The way you choose to cook your meat also determines how healthy your meal turns out. Grilling can help to drain any excess fat and juices. You could opt for grilled sausages with a generous portion of peppers and onions or a tasty baked sausage casserole. Mel is a freelance blogger working with the good people over at Love Pork, who champion quality British pork.